Displays the weather along with words of wisdom. Top community discussions about Zoltan! Is there a better alternative to Zoltan!? Is Zoltan! really the best app in Miscellaneous category? Will Zoltan! work good on macOS 10.13.4? 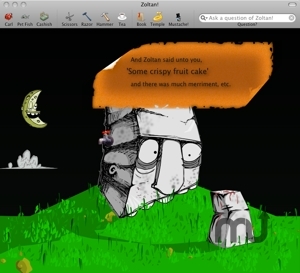 Zoltan is an application that will display the weather and possibly give you words of wisdom... Or at least entertain you with his meaningless wit! Zoltan grows grass... then you cut it! Read the Book of Zoltan! Zoltan! needs a rating. Be the first to rate this app and get the discussion started! See more reviews for Zoltan!